shared what I currently do to my hair. So this is an update on the products that I use on a regular basis as I’ve edited it over the years. For my actual routine, click here. Well in short, I’ve gone back to basics and my old faithfuls. 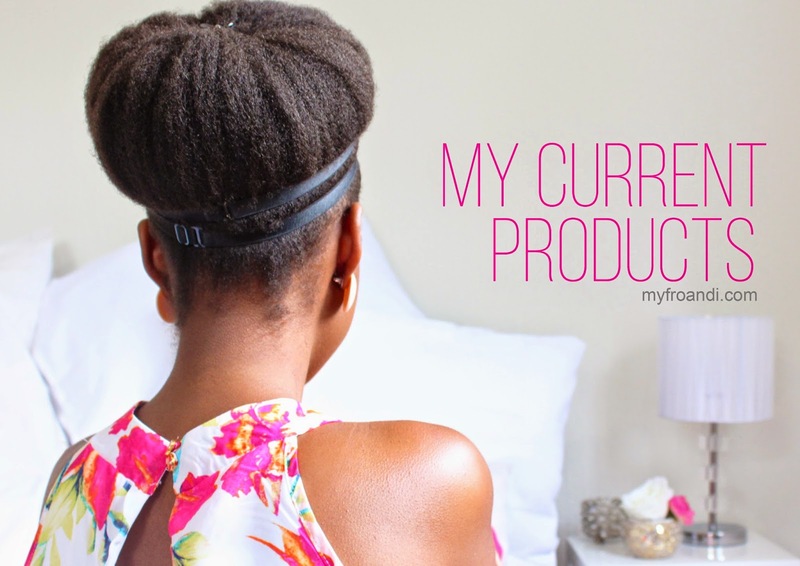 There was a point when I became a product junkie and was just keen on trying everything out there that is targeted to natural haired women. One of the first things I did when going natural is I made my own hair spritz and butter. Mainly because I couldn’t at that time find anything that I believe worked on my hair. Since then until now, I’ve tried a myriad of different products. Some I’ve added some to my mix, and others I wouldn’t let touch my hair again. I even substituted my daily spritz for other leave-in conditioners, or mists that promise moisture. Yet after using these products for a few days, my hair would cry for the spritz and I’d get back to using it. And on it went with the same back and forth happening with my hair butter, until last year. It hit me that at the moment my hair seems to be happy with certain things so why not stick to them? Not to say I’m not ever going to try new products, I still experiment, but I know now that the following are what my hair loves for sure. I wash my hair every two weeks – alternating with Shea Moisture’s Raw Shea Butter Moisture Retention Shampoo and with conditioner as a co-wash. At the moment, I’m not married to a particular conditioner but I do love Mizani’s Curl Cleanser and can also vouch for Tresemme Naturals Conditioner and Shea Moisture Raw Shea Butter Restorative Conditioner. I deep condition with Vatika’s Intensive Nourishment Conditioner. I. LOVE. THIS. The scent is quite strong which is unlike me but I forgive it because the slip is amazing and it almost detangles my hair for me. Detangling with my fingers or wide tooth comb is made much easier with this on. I use the ORS Lock & Twist Gel to help lay my hair down for slicker styles. It’s the best gel I’ve used because it doesn’t flake and it has a nice moisturising feel to it. A little goes a long way. I spritz my hair twice daily with my Homemade Daily Spritz – once in the morning before I take down my twists/pigtails or braids. I make sure the spritz is not longer wet before I take down as this reduces shrinkage. I spray again in the evening before I set my hair for bed, or depending on the style I want I prep my hair dry then spritz. I use my Homemade Butter on my hair to seal moisture after I’ve washed, deep conditioned etc. I also use it every other day on my scalp too or whenever I feel my hair needs to retain moisture during the week. I use it on my edges to soften them if I’m taking a break from using gel. 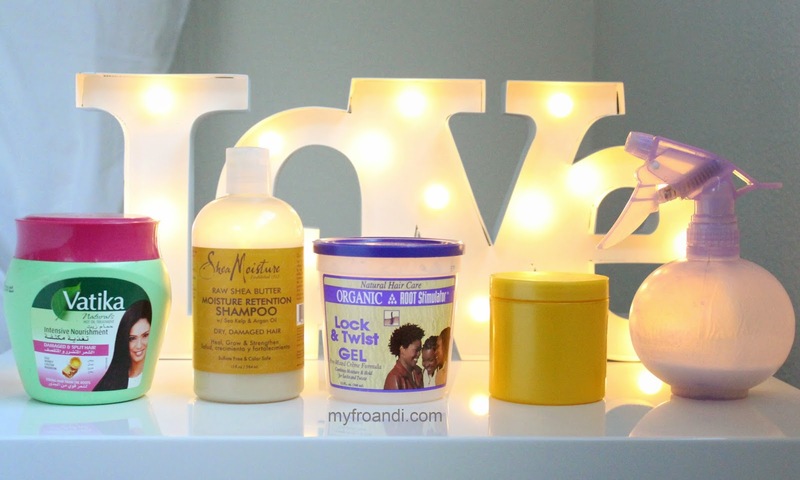 Shea Moisture products are available in SA from Tender Loving Hair. The prices are a bit steep so alternatives I can recommend is ORS Creamy Aloe Shampoo and Replenishing Conditioner. Vatika products are available from Indian beauty stores. In Tanzania, I get them from Shopper’s Plaza. ORS Lock & Twist Gel is to mystery for me. I’ve been trying to get a hold of them in SA but they’ve disappeared from the shelves. So I get my stash from Tanzania when family or friends come or when I go to visit. My alternative for when mine runs out is Isoplus Styling Gel you can get from Clicks. Homemade Butter recipe can be found here. Play around with the amounts you put in until you have a consistency you and your hair likes. You can get the shea butter for this from Faithful to Nature. Homemade Daily Spritz recipe can be found here. Some ladies have said it’s too oily for them or their hair doesn’t like glycerin etc. Again, play around with the ratios of ingredients until you find something you and your hair like. My fro and yours will not like the exact same things so it’s up to you to experiment and find a happy medium. I get all of my ingredients for this spritz from Dischem. Previous Post Watch the Garnier #BeSensational Makeover Winners! Next Post Budget Beauty Buys: The 2015 L’Oréal Sale is On! Hi how do i convert my hair from relaxed to natural without damaging it,is this even possible? i just have 1 tiny question, do you use a hair dryer to dry your hair? I think my hair is similar to yours but mine is really soft in the front and back…i used a Blow Out Relaxer on my hair about 4 months ago…i totally regret it now because my hair is a Fro everywhere but my hair line…i' falls towards my face, especially when i want it to be a puffy fro. One can also get Vatika from an indian stall in the Brightwater Commons in Randburg. It opens Tuesday to Sunday. I have always walked past but I will buy and try this now Aisha. Thank you I will go this sunday to buy it.